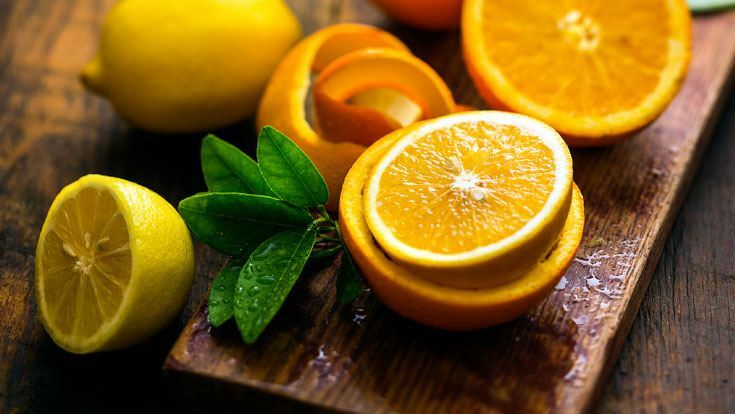 Citrus fruits are so good for us — they’re like sunshine on a cold winter day. Not only are they sweet, low in calories, high in fiber and very portable, they’re also an excellent source of flavonoids, folate and pectin. And — as most of us learn from an early age — they’re a major source of vitamin C.
However, even though we know that that these nutrients are crucial to a healthy body, about 20 to 30 percent of Americans have low levels of vitamin C in their blood. What’s worse, 16 percent are actually deficient in this vital nutrient. Cells need constant replenishment of vitamin C. Our bodies don’t make it, and the amount we get from food doesn’t last long in our systems. Vitamin C protects our cells by neutralizing free-radicals. This is important because DNA and cells damaged by free-radicals can lead to cancer and heart disease. Citrus is also rich in flavonoids, which are an antioxident, anti-inflamatory, antiallergenic, antimicrobial and antimutagenic. This means that citrus helps prevent cells from initiating the first steps in the development of cancer and other chronic diseases. A diet loaded with high fiber fruits like citrus also helps reduce the risk of obesity, heart disease and diabetes. When eating citrus, don’t skip the pulp and whitish pith interlaced within the juicy fruit part. The pulp has twice the concentration of vitamin C than the peel and 10 times the amount in the juice. There is also a great amount of pectin in the white pith lining of citrus. Pectin is a dietary fiber that helps reduce cholesterol and also stabilize blood sugar. When you’re out grocery shopping, remember that citrus fruits don’t ripen after picking. Choose what’s ready to be eaten. Whole citrus fruits can be stored in the refrigerator or at room temperature. Just make sure you take them out of bags and boxes so they don’t become moldy. There are lots of easy ways to incorporate citrus into your regular diet. Try French Toast A L’Orange or Citrus Apricot Couscous. For a really refreshing and healthful drink, have a Fresh Orange Lemonade.